Any star player would be proud to receive this stand-out trophy, featuring a football player propelled by an abstract shooting star. The figure and star are bronze in color with gold trim and a black trophy base. 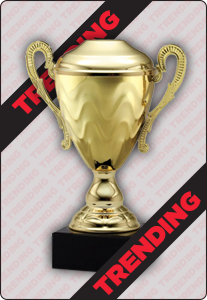 Choose to engrave this trophy with player name, date and event or a special message for an unforgettable memento.